Could Vancouver’s housing heat be moving to the GTA? Vancouver home sales have cooled by some 40% year-on-year, on a continuing descent that predates but has presumably been helped by a foreign-buyer tax imposed in August. However, some of the foreign capital fleeing the red-hot BC city may be stoking an overheated Toronto housing market. Bank of Montreal senior economist Sal Guatieri has cited a recent poll of Toronto realtors indicating that 4.9% of transactions in the 12 months leading to November involved foreigners, according to the Globe and Mail. Toronto’s surging prices have caused spillover into surrounding regions that have more affordable properties, he said. The Canadian government has instituted mortgage and tax measures to tame runaway housing markets, which observers believe will ease the city’s housing market, but not cause a contraction. 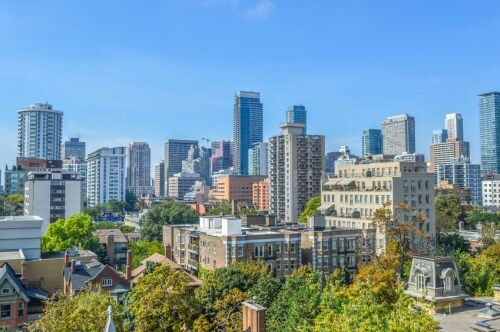 Home price surges in Toronto and surrounding communities have led to warnings of overstretched home buyers – a risk Guatieri cited in his outlook. “According to the latest Financial System Review from the Bank of Canada, the proportion of highly-indebted households is rising quickly in the GTA and surrounding areas,” he said, adding that skyrocketing prices could also lead to overbuilding and increased speculation among investors and developers. The Toronto Real Estate Board, who commissioned the survey Guatieri cited, seem intent on riding the bull market. Warning against a foreign-buyer tax similar to the 15% levy that the BC government imposed in Vancouver, the board said that surging prices in the GTA should be dealt with through policies targeting the lack of supply. In a separate note, BMO chief economist Douglas Porter supported tax-based cooling measures, questioning the Toronto board’s assertions that following Vancouver’s lead would wreak havoc. “Is a 22-per-cent surge in prices not already havoc? It’s certainly not healthy, except perhaps to the finances of said realtors,” he said.